On Jane the Virgin Season 2 Episode 2, Jane is consumed by motherhood, but still must deal with the two men who love her, and her fears of losing Mateo again. Meanwhile, Petra gets takes a pregnancy test. When you watch Jane the Virgin Season 2 Episode 2, you'll see Jane come to realize she loves both Rafael and Michael and can't make a decision. She is also seeing visions of Rose, thinking she'll lose Mateo again. Meanwhile, Petra finds out she's pregnant just as Rafael gets the call from the fertility clinic saying Petra took his last sample. Meanwhile, Rogelio and Xo rekindle their love on a cruise ship, and Alba decides to apply for her green card. Finally, Luisa is kidnapped by a mysterious man. 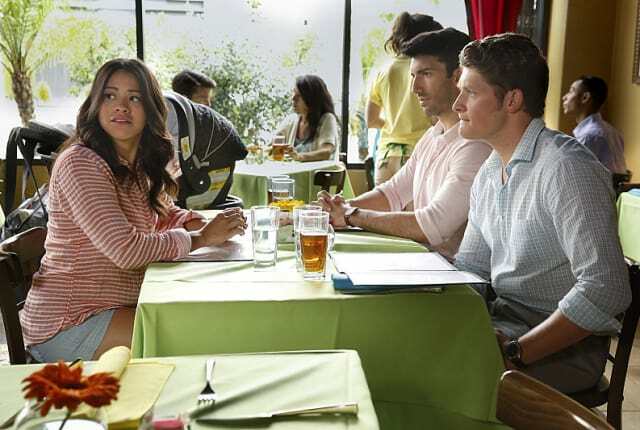 On Jane the Virgin Season 2 Episode 2, Jane finally feels she's in step with Mateo, but finds she's out of sync with both Rafael and Michael.